My husband went all out and bought both of us huge flags to wave, along with the flashing sword for my son that I already mentioned. We waved our flags with a great flourish, purposefully waving them in each other’s space from time to time. Our knight, the red and yellow knight, never won a single event. My son kept asking if he could root for the blue knight instead. Ah, it was a great, silly time. Yes, I tend to be a serious person, even though I do get pretty goofy sometimes (as evidenced at Medieval Times). As a teacher, I try to impart knowledge to my students regularly — but wisdom goes deeper than that. When I consider what wisdom really is, a lot of it has to do with how we think about life. It’s not living for today. It’s remembering that we are meant for a true kingdom, and as Christians, we are adopted as sons and daughters of the true king, the Prince of Peace. Bible Journaling is one of the ways that I take time to put my focus on the bigger picture; it is a time of reading the word, prayer, and listening. God values wisdom (He is wisdom), and he honors those who seek it. Jesus said, “I am the way, the truth, and the life. No one comes to the Father except through me” (John 14:6). As Christians, we are different. We base our lives in the belief that Jesus is the way, the truth, and the life. We think differently, and that is a good thing. Have you ever had a certain person’s story from the Bible really stick with you the way that Solomon’s request for wisdom stuck with me when I was young? No, Solomon was not perfect, but his request for wisdom was honored by God. As you consider a person from the Bible who has inspired you, what was it about the person’s story that was meaningful for you? Maybe it was David, Esther, Moses, or Timothy. Create a Bible Journaling page based on the wisdom you have gained from that person’s life. Hope is the thing . . . I have loved Emily Dickinson’s “Hope is the Thing with Feathers” ever since I read it a couple years ago while I was working on my master’s degree in education. Hope keeps us going in the hardest of times. This poem describes hope as something that gives us what we need to go on, and it is just there, just with us. Do you ever feel like the bird in the storm, and you reach deep inside and find hope, the “thing with feathers,” is still there? In her personal life, Emily Dickinson struggled when it came to faith, but her poem speaks to me. She is one of my favorites. In Romans 5:3-5, Saint Paul writes about hope from a Christian perspective.
. . . but we also glory in our sufferings, because we know that suffering produces perseverance; perseverance, character; and character, HOPE. And HOPE does not put us to shame, because God’s love has been poured out into our hearts through the Holy Spirit, who has been given to us. When we go through hard times or feel like we are encountering one obstacle after another, it’s the Holy Spirit that can lift us up. It’s the “roar” in your spirit that says to keep going when you are walking in God’s truth. Over the summer, I like to start each morning by reading a devotional while my son is still sleeping. As a teacher, the school year demands more than anyone (except other teachers) could ever really imagine; I am very thankful to have a job that impacts so many lives, but it does mean I must fill my own tank so that I can meet the needs of those who are in my classroom. Every summer that I have chosen to start my morning with a devotional, I have not been disappointed. This summer, I decided to read a chapter from I Am: A 60-Day Journey to Knowing Who You Are Because of Who He Is by Michele Cushatt each morning. I highly recommend it. Another good one that I read one summer was None Like Him: Ten Ways God is Different from Us (and why that’s a good thing) by Jen Wilkin. I highly recommend that one as well. For Christians, spending time in the word opens us up for communication from the Holy Spirit, and it is absolutely necessary in this world of obstacles. This morning, my devotional included the following thought about the Latin meanings behind the word inspire. To inspire . . . has of course the stem spir in it. It is, very literally, to give or put spirit into someone. To inspire someone is way more than making them happy or amazed or even making them feel good. It is to lend them spirit when they are short. And of course because of the incorporeal nature of both air and spirit, the act of inhaling also became known as inspiration. In that sense too: it is like mechanical ventilation for a soul that’s lost its resolve for a moment. But when the kindness and love of God our Savior appeared, he saved us, not because of righteous things we had done, but because of his mercy. He saved us through the washing of rebirth and renewal by the Holy Spirit, whom he poured out on us generously. For Christians, the “thing” that communicates what we need, that stirs the hope in our souls, is the Holy Spirit. When we ask Christ into our lives, truly believe in him for the forgiveness of sins, and seek to follow Him — when we become Christ-followers — we are given the gift of the Holy Spirit. We are not promised an easy life, but we can see how perseverance builds character. It gives hope a chance to break through. If we are truly in God’s word, not everything that we read will be sunshine, moonbeams, and easy-breezy. It challenges us. Some of the truths are hard. I experienced that this summer as I read through the book of Romans. Sometimes we need to persevere even in reading the word. Even the truths we struggle through are ultimately good ones. There are days when reading God’s word might not make you feel good, but keep going. Pray about it. In with the hard truths, God is shaping something beautiful that is for our good. Go forward in hope today! 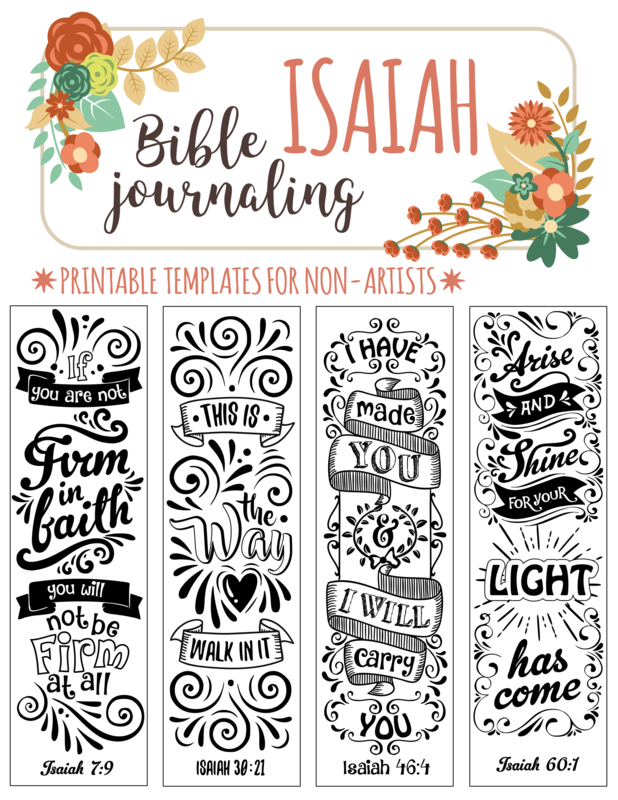 Bible Journaling Challenge: Find a verse about hope or the Holy Spirit that speaks to you, and create a page about it in your Journaling Bible. You could just write out the verse, or you could illustrate it with something meaningful to you. If you are not sure what verse to use, Romans 5:3-5 is a good one. Posted on August 8, 2018 August 16, 2018 Categories Bible JournalingTags Bible Journaling, Emily Dickinson, hope, I Am: A 60-Day Journey to Knowing Who You Are Because of Who He Is by Michele Cushatt, Romans 3:3-52 Comments on Hope is the thing . . . When I was a girl, my Grandma Eckstine would often give me a palm leaf in the shape of a cross from her church on Palm Sunday. Grandma Eckstine is the person who comes to mind first when I think of spiritual heritage. She lived her life with great faith and passed that faith on to a very long line of children, grandchildren, and great grandchildren. As Palm Sunday approached this year, my mind kept going back to that cross-shaped palm leaf grandma would give me as a girl. Nowadays, my family goes to a non-denominational church that celebrates the major Christian holidays like Easter and Christmas, but many events on the traditional church calendar are not directly celebrated. In other words, we will have a big Easter or Christmas service, but many people in the congregation have probably ever heard of Maundy Thursday. I had not heard of many of the church holidays myself until I was reading A Homemade Year by Jerusalem Jackson Greer about a year ago. My grandma, on the other hand, faithfully attended a Lutheran church where Palm Sunday was a regularly observed part of the church year. Everything folds upward so I can still read the scriptures underneath. Anyway, back to the palm leaf. It was really on my mind this year. I knew my family would be travelling to take my son on a special Easter Bunny train ride. As our family took off on our road trip toward the bunny train, I prayed that God would bring us to a church where we could celebrate Palm Sunday in a more traditional way this year. Deep down, I really wanted my son hold a palm leaf in his little hands. The further we drove down the road, the more that it seemed like our timing was not going to be right in order to go to a service anywhere and still make it to the train in time. I did some Googling and praying as we went down the road, and our family parked outside a United Methodist church in Hollidaysburg, Pennsylvania, with literally no time to spare. We walked in and sat in the back row. I hoped my son would be quiet in this traditional service. As the service unfolded, sure enough, my son walked back to our pew with a palm leaf that I later folded into the shape of a cross. The entire service was beautiful. It really got our family into the mindset of the Easter season. Walking out of the church where we didn’t know a single soul, I smiled and silently thanked God for bringing us to such a lovely, meaningful service. To commemorate that memory, along with the memory of my grandma giving me palm leaf crosses as a girl, I created a page in my Journaling Bible. Everything is attached with clear tape and washi tape so that it can be folded up and away from the words on the page. I can still read every word underneath. Plus, now I will have a page to remind me of Palm Sunday 2018. After creating this page, I am already thinking about other spiritual memories that I would like to commemorate in my Journaling Bible as well. When it comes to spiritual memories, I think it is important to write things down and memory-keep because we really do tend to forget. A Bible Passage About Remembering . . .
Bible Journaling Challenge: Do you have a spiritual memory that you could commemorate in your Journaling Bible? For my memory-keeping page, I included the dried palm leaf that I folded into a cross and parts of that day’s church bulletin that I cut out and painted with simple watercolors.